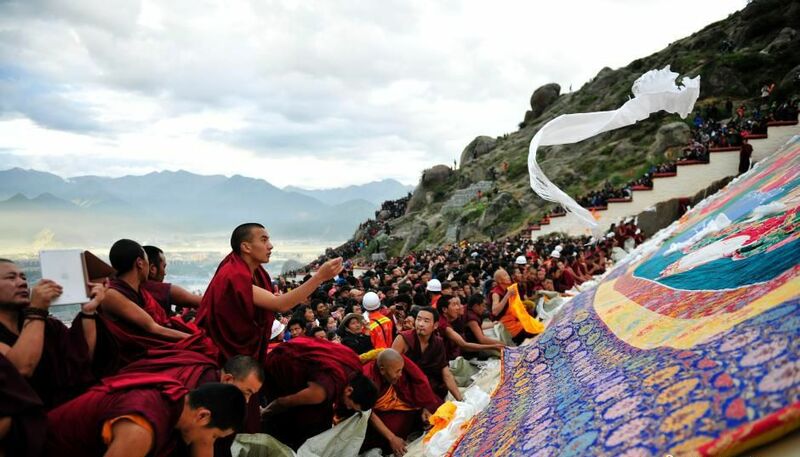 large crowd of people attending the annual Shoton, or ‘Yogurt Feast’, festival at Drepung Monastery in the outskirts of Tibet’s capital Lhasa. The festival, which has a 17th century origin, is being held this year from Aug 25 to Sep 2. (TibetanReview.net, Aug28, 2014) – China has employed drones and other aircrafts as well as deploying massive police and paramilitary police forces besides installing ground security paraphernalia of various kinds to keep watch over the large crowd of people attending the annual Shoton, or ‘Yogurt Feast’, festival at Drepung Monastery in the outskirts of Tibet’s capital Lhasa. The festival, which has a 17th century origin, is being held this year from Aug 25 to Sep 2. A major highlight of the festival is the unveiling of a giant thangka, or scroll painting, of the Buddha on a monastery hillside. Uniformed security personnel were reported to be deployed in large number behind this hill. 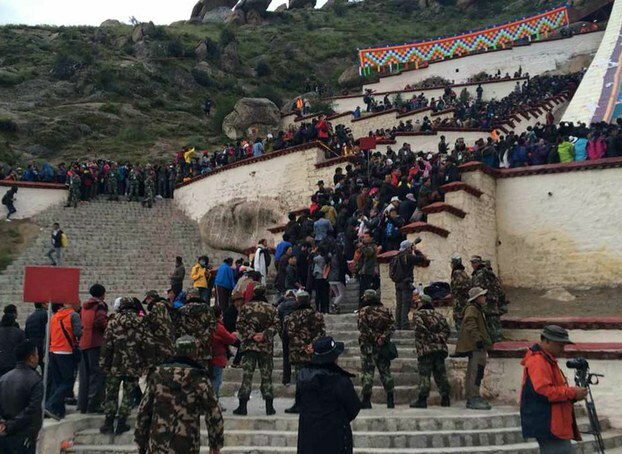 Security deployments in Lhasa city itself, as well as in the nearby major monasteries of Sera and Ganden, were also reported to be larger than usual. China uses the festival to promote a good image of its rule in Tibet, including as a major annual tourism event. It has given this year’s festival the theme of “Prosperous Family, Happy Lhasa”. China’s official Xinhua news agency said the festival was featuring 13 separate exhibitions to showcase traditional dance and cultural performances, photo contests, and displays of religious art. The festival traditionally marked the end of annual religious retreat by Buddhist monks with offering of yogurt by the lay public. This is said to be a tradition dating back to the time of the Buddha in India some two and half millennia ago.